We are conveniently located in the Historic Tremont neighborhood, near I-90, I-480, and I-71 Freeways. Our school sits just west of the Cuyahoga River and south of the Ohio City neighborhood, just minutes from Downtown Cleveland. We serve students from all over Greater Cleveland, both East and West side communities. Please click here to see if your student qualifies for free transportation. 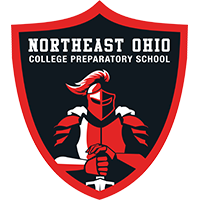 Northeast Ohio College Preparatory School is an innovative school with a vision of creating a culture of high expectations for behavior and academics through rigorous, research-based curricula and a focus on achievement. It is our goal that our students will attend a college preparatory high school and ultimately gain acceptance to, and graduate from, a four-year college. It is our expectation that 100% of graduates will positively affect change in their local communities while making a contribution to our global society! To date, we have graduated 100% of our High School Senior classes, and students have been awarded more than $3 Million in scholarships! We encourage all high school scholars to visit the Ohio Means Jobs website. It is Ohio’s no-cost, career planning system that offers comprehensive, career exploration tools, online training and resources specifically for students. OhioMeansJobs.com allows students to learn more about their career interests and in-demand jobs, build resumes, search for college and training programs, create a budget based on future expenses, and develop meaningful academic and career plans for high school and beyond.